Below we are presenting information about the Dungeon Finder and how to use it. What is the Dungeon Finder? The Dungeon Finder is a feature which aids the player in finding groups for our custom dungeons. How do I use the Dungeon Finder? While ingame, press the default key bind (I) or click on the Dungeon Finder button in the micro menu. In there you select your role, Tank, Healer or Damage, then select the Dungeon type, Specific or Random and click on the Find Group button. This will group you with other players queueing for the same Dungeon type as you, filling up the missing roles and teleport your group inside the dungeon. What are the Specific and Random Dungeon Types and do they have extra rewards? What is the Specific Dungeon Type? It is a type of Dungeon Finder where you can queue for specific dungeons that you can select, either one or multiple of the available list. Are there any extra rewards for completing a Specific Dungeon? For this Dungeon Type there are no extra rewards. What is the Random Dungeon Type? 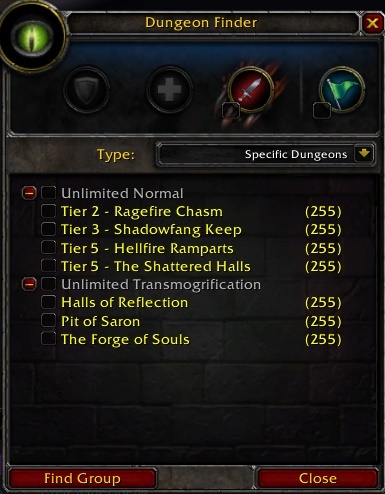 It is a type of Dungeon Finder where you can queue for either Tier Dungeons or Transmogrification Dungeons and get a random Dungeon selected from the Specific list. Are there any extra rewards for completing a Random Dungeon? For completing a Random Unlimited Dungeon, you get rewarded with a Satchel of Helpful Goods, which contains Dungeon Finder specific currency based on the highest Tier quest you have completed. For completing a Random Unlimited Transmogrification Dungeon, you get rewarded with a Satchel of Helpful Goods, which contains a number of Transmogrification Tokens. While you can get multiple Satchels per day from both Dungeon Types, only the first bag per day reward the highest amount of currency. 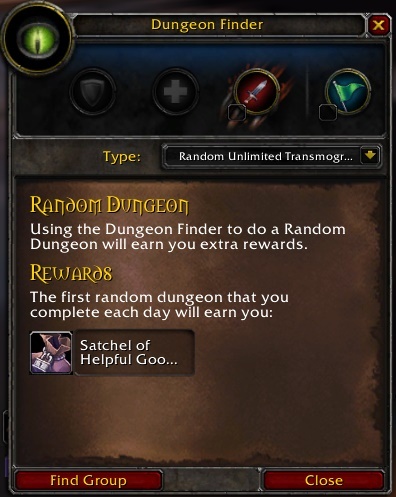 How does the Random Unlimited Dungeon Satchel reward work? Each main Tier instance has a quest for completing the instance (killing the last boss). Completing that attunes you to receive special Dungeon Finder tokens (RDF - Tier X Token) equal to your highest completed Tier quest. You can hold a maximum of 1000 Dungeon Finder tokens for each Tier, and can only recieve tokens from Tier 2, up to the penultimate Tier. For receiving RDF - Tier 2 Tokens requires no attunement. What are the quest requirements for obtaining the RDF Tokens ? What are the RDF - Tier X Tokens for ? They can be used to buy their own Tier specific Tier tokens, trinkets, Tier specific currency and the lower special Dungeon Finder tokens. The vendor can be found in the mall, near the Tier vendor. Last edited by Jinha; 2 Weeks Ago at 07:04 PM.